A new 36 bed wing at one of Ireland’s leading retirement villages, Bon Secours Care Village, Mount Desert, Lee Road, Cork, has been officially unveiled today by Minister for Foreign Affairs and Trade Simon Coveney. 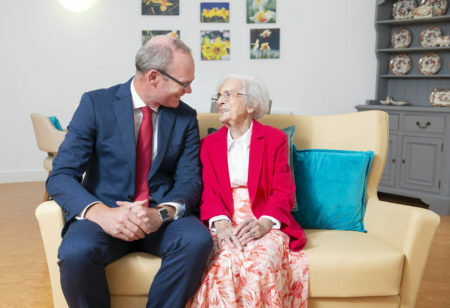 Maura Roche (100), a resident at Bon Secours Care Village, Mount Desert, Cork, photographed with Minister for Foreign Affairs and Trade Simon Coveney at today’s launch of a new 36 bed wing at the leading retirement villages. 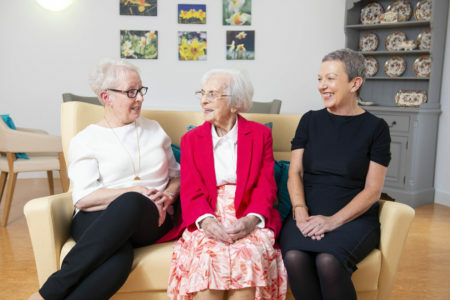 Maura Roche (100), a resident at Bon Secours Care Village, Mount Desert, Cork, photographed with her Daughters Susan Woodgate from Hamshire and Jill Potter Cogan from Ballyhaunis at today’s launch of a new 36 bed wing at the leading retirement villages. Developed at a cost of €11m by Ireland’s largest private healthcare provider Bon Secours Health System, the facility brings to a total of 97, the number of private en-suite rooms now in place at the facility located just off Lee Road, Cork. The extension, which opened in June at full capacity, has created an additional 32 jobs at the Care Village, adding to the 70 already in place. The investment has also seen the introduction of four newly refurbished enclosed gardens, lounges and seating areas with views over the Lee Valley for residents. The award-winning Care Village comprises St. Joseph’s Hospital Care facility, to which the extension has been added, as well as Cedar Lodge, which comprises seven individual independent living apartments. St. Joseph’s provides premium care for residents requiring short term, long term, convalescent, respite and palliative care. The development is part of a wider Bon Secours Health System investment programme that includes the recent opening of a state-of-the-art Cath Lab in Galway, a €77m development in Cork that will comprise a state-of-the-art radiotherapy centre in conjunction with the hospital’s partners UPMC and a new partnership and upgrade in radiology services in the Bon Secours Barringtons at Limerick. Opening the new facility, Minister Coveney said: “Bon Secours has been operating here since 2002 and in that time has developed a reputation for putting its residents at the very centre of a very special, high-quality and caring service. That’s why the extension we are opening here today was a much awaited one and no surprise also that all 36 additional beds were occupied pretty much immediately. Our elderly citizens deserve this standard of care that the Bon Secuour and others across the country provide.